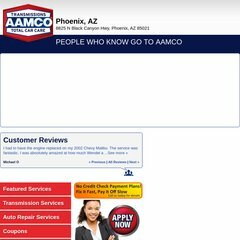 Topics: Special Offers, Appointment Scheduling, Customer Reviews, Total Car Care, Free Check Engine Light, and Transmission Rebuild. It is hosted by Ntt America Inc (Colorado, Centennial,) using Microsoft-IIS/6 web server. Its 2 nameservers are ns11b.verio-web.com, and ns11a.verio-web.com. The programming language environment is ASP.NET.